CCNA Routing and Switching Practice Tests is your ultimate tool for exam success and compliments the Sybex Deluxe Study Guides and Study Guides for the CCENT and CCNA. Whether you're taking the 200-15 Composite Exam or the two-part 100-105 and 200-105 exams, this book gives you the practice you need to study smarter. Seven completely unique 200-question practice tests cover the seven CCNA Routing and Switching objective domains, and two additional unique 50-question practice exams provide even more opportunity to find areas where further review is needed. These 1500 questions cover everything you'll see on the exam—network fundamentals; LAN switching technologies; routing technologies; WAN technologies; and infrastructure services, security, and management—so you can avoid any exam-day surprises. Fully aligned with the latest versions of the exams, this book helps you focus your study time and remove uncertainties so you can face the exam with confidence. The CCNA Routing and Switching exams test your working knowledge of IP data networks, addressing, routing, and services; network device security; troubleshooting, and more. These practice tests cover it all to help you discover what you already know, what you still need to learn, and what to expect on exam day. 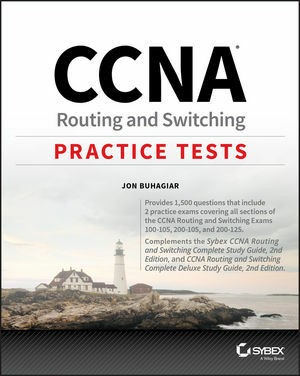 The CCNA exams cover a broad range of routing and switching topics, and the questions can get fairly in-depth. Practice makes perfect, and practice tests tailored to each of the seven exam domains provide an ideal opportunity to ensure your own top-notch performance. When you're ready to get serious about CCNA certification, CCNA Routing and Switching Practice Tests are your solution for ultimate exam-day confidence. Jon Buhagiar, CCNA, MCSA, MCSE, N+, A+, BS/ITM, is Supervisor of Network Operations at Pittsburgh Technical Institute. In addition to teaching, he has been creating course content for the past 17 years. Some of his more recent work can be found on YouTube: http://www.youtube.com/networkedminds.